The NLWC would like to thank you for joining our Club in the past. We are currently in the midst of the campaign for the 2018-2019 membership year. We want to thank all past members for your support and hope that you will again join us this season. Your support is needed and much appreciated! The Nittany Lion Wrestling Club’s goal is to be the premier wrestling club in the United States! USA Wrestling, the national governing body organization for the sport of amateur wrestling, has designated Penn State University as an Olympic Regional Training Center. The NLWC is the administrator of this U.S. Olympic Regional Training Center, and conducts practices in the Penn State Wrestling Room in the Lorenzo Wrestling Complex. The Resident Athlete Program is comprised of elite wrestlers whom the NLWC coaching staff has recruited to live in Central Pennsylvania and train at the NLWC Regional Olympic Training Center. This program is designed to provide the coaching, training environment, and financial support necessary for these individuals to compete for and win Olympic and World Championships. Resident Athletes for the NLWC during the 2018-19 Season are Bekzod Abdurakhmonov, Jordan Conaway, Franklin Gomez, Josh Rodriguez, Zain Retherford, David Taylor, Ben Provisor, and Riley Lefever. These wrestlers are former NCAA National Champions and All-Americans and are some of the top athletes in the world. For the upcoming season, the NLWC may also add some additional wrestlers to the Resident Athlete roster. The NLWC is very proud to be represented by these fine young men, both on and off of the mat! 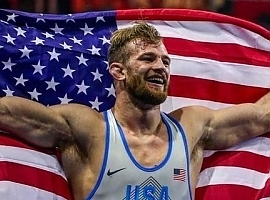 The above athletes are coached by Cael Sanderson, Cody Sanderson, Casey Cunningham, Jake Varner, Mark McKnight, and Eric Thompson whom comprise the NLWC Resident Athlete Program and U.S. Olympic Regional Training Center coaching staff. These coaches are widely recognized as the best in the world and have done an incredible job of developing the wrestlers in the Resident Athlete Program. The Nittany Lion Wrestling Club provides training and competition opportunities for Centre County area collegiate-level wrestlers who are qualified to participate in the Club’s Regional Training Center practices with the resident athletes. The Nittany Lion Wrestling Club offers training sessions and practices for scholastic-level wrestlers. These sessions range from a youth rec program for beginning wrestlers to hard training sessions for experienced junior and senior high school wrestlers. The Nittany Lion Wrestling Club hosts National Team Training Camps in which the U.S. National Team Coaches and the top wrestlers in the U.S. train together with the Club’s Resident Athletes and Qualified Collegiate Athletes. To become a member of the Nittany Lion Wrestling Club please follow the link Join. A variety of membership options are available and the opportunity to join online today.